While strolling through Paris—or just about any French city, for that matter—it’s impossible to avoid the whimsical, brightly painted carousels studding the ubiquitous plazas, parks, and boulevards. Red-cheeked children beg grown-ups for tickets, and more often than not the adults hand over the necessary Euros, remembering with nostalgia riding the Hôtel de Ville’s frothy double-decker Belle Epoque carousel or whirling about on the oldest such machine in Paris (1879) in the Jardin du Luxembourg—designed by none other than Charles Garnier, architect of the Paris Opera House. 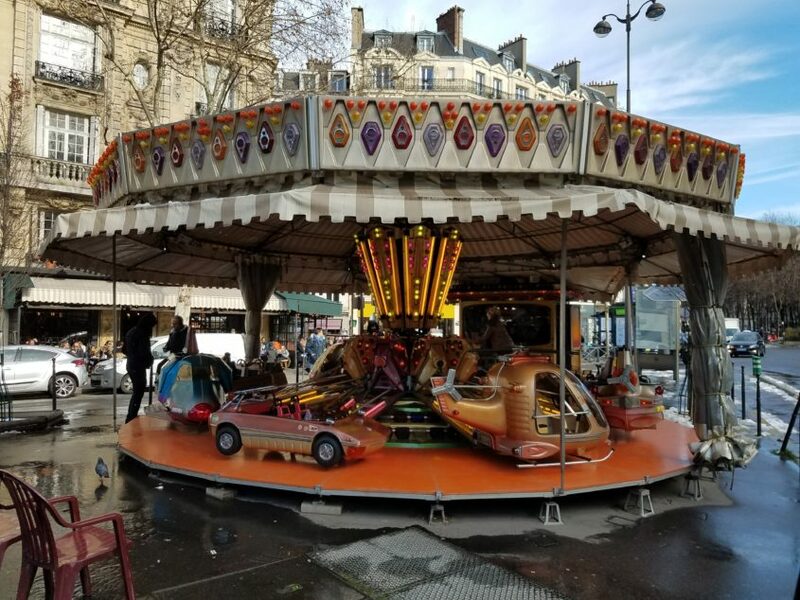 Whereas riding a merry-go-round might be a relatively rare treat for children in the U.S., in France it’s a regular occurrence. In some ways, it is no wonder. 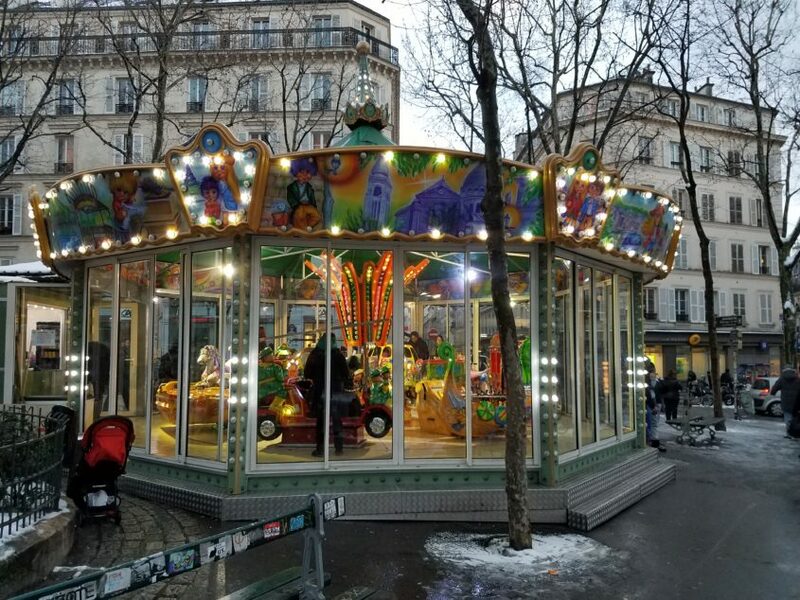 The nostalgic whimsy of the manège (French for carousel) fits easily into a French style of life: one that harkens back to earlier days, revering history, tradition, and shared experiences handed down through the generations. Grandparents and nannies, mothers and fathers, aunties and uncles love to spend the day in the park with their charges, riding the same carousels, running through the same hedge mazes, and even watching the same puppet shows they watched as children, 20 or 50 years hence. In the Champ de Mars, in the stunning shadow of the Eiffel Tower, the attendant at a simple hand-cranked carousel passes out batons so children can try to “catch the rings” as they whirl by; Louis XIV himself designed a similar jeu de bagues carousel to delight Marie Antoinette in the gardens of Versailles. 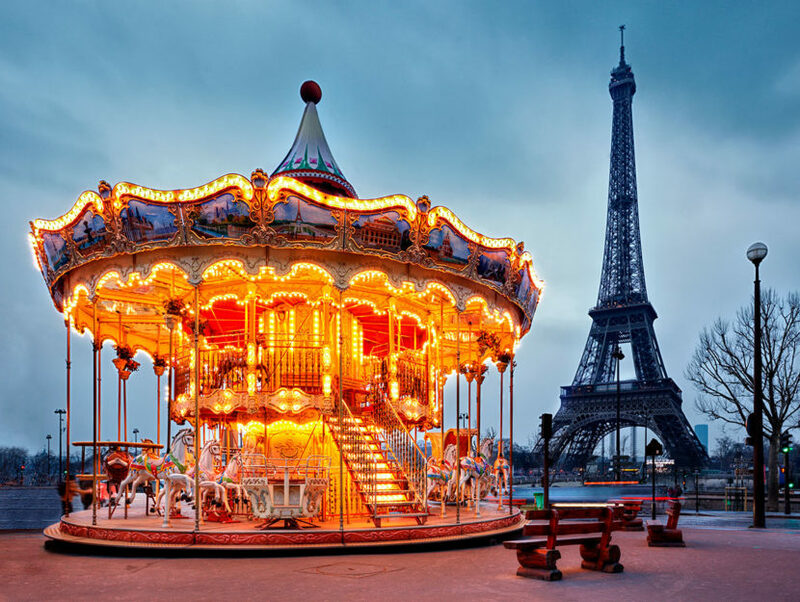 Nearby, on the corner of the Pont d’léna and Quai Branly, one of the most photographed merry-go-rounds in Paris, the Eiffel Tower Carousel, sits right in front of the iconic tower and is the perfect setting to take a souvenir snapshot. The word carousel derives from the Spanish carosella—or the Italian garosello, depending on whom one asks—which means “little war” and refers to a Byzantine battle game brought to Europe during the time of the crusades. The machines began as a safer alternative to jousting and other forms of combat exercises, which often injured knights-in-training. Over time, non-soldiers started climbing on the fake horses, just for fun, and it didn’t take long before skilled artisans got to work carving whimsical figures—not just horses but other farmyard animals, wild beasts, and even mythical creatures. Thus, the modern carousel was born. Before the advent of electricity, carousels were cranked by hand or pulled by draft animals; sometimes a circular pit was dug into the ground beneath the main platform, where the horses, donkeys, or oxen trudged on their endless rounds. But it was the introduction of the steam engine that spurred the rapid proliferation of the fanciful contraptions throughout Europe and the Americas. These engines also powered the popular band organs, whose carnivalesque music is now so associated with the joy of riding a merry-go-round. Carousels became wildly popular in the 1800s and continued to enchant not only children but adults as well through the first half of the 20th century. In the U.S., the popularity of the merry-go-round waned with the advent of roller coasters, but theme parks are not as common in Europe. Also, in France carousels typically stand alone, without the accompaniment of a carnival or other rides. Gustave Bayol is the most famous carousel carver of France. Bayol ran his own carousel factory in the city of Angers at the end of the 19th century and into the beginning of the 20th, and his workshop produced dozens of manèges, many of which are still twirling round and round, delighting one and all. In Paris, a simple, green-roofed carousel in the Jardin du Ranelagh features Bayol’s signature sweet-faced barnyard animals; another can be found in the Bois de Vincennes, outfitted with lots of adorable little pigs. It turns out that the House of Bayol created hand-carved and painted merry-go-rounds not only for city governments, but also for private châteaux. Can you imagine being wealthy enough to custom order your own hand-carved carousel for your children’s delight? Paris isn’t the only French city where one finds such manèges. Avignon boasts a Belle Epoque beauty in the main square, called the Place de L’Horloge, and there’s a charming, fairytale-themed carousel by the fountain in the heart of old-town Dijon. On the banks of the Loire River in Nantes, the giant Marine Worlds Carousel has pride of place alongside a massive mechanical elephant and other steam-punkesque creations. In the countryside, even the smallest villages might bring in temporary carousels to brighten up Christmas fairs, harvest celebrations, or regional festivals. So the next time you’re in Paris, or any other city of France, be sure check out the many manèges. Many are historic wooden machines, some are newer fiberglass models, but all are charming. You might even consider climbing aboard—aren’t we all children at heart when we’re twirling around and around on a carousel? JULIET BLACKWELL was born and raised in the San Francisco Bay Area, the youngest child of a jet pilot and an editor. 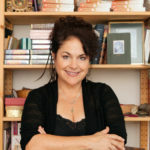 She graduated with a degree in Latin American studies from the University of California, Santa Cruz, and went on to earn master’s degrees in anthropology and social work. While in graduate school, she published several articles based on her research with immigrant families from Mexico and Vietnam, as well as one full-length translation: Miguel León-Portilla’s seminal work, Endangered Cultures. Juliet taught medical anthropology at SUNY–Albany, was producer for a BBC documentary, and served as an elementary school social worker. Upon her return to California, she became a professional artist and ran her own decorative painting and design studio for more than a decade. In addition to mainstream novels, Juliet pens the New York Times bestselling Witchcraft Mysteries and the Haunted Home Renovation series. As Hailey Lind, she wrote the Agatha Award-nominated Art Lover’s Mystery series. She makes her home in northern California, but spends as much time as possible in Europe and Latin America.